The designers of the Multipom have been kind enough to send me one of these little gadgets so that I can try it out. This is me discussing how I fared following the packet instructions and making 12 tiny pom-poms in DK yarn. I chose acrylic yarn for these test pom-poms, because I thought that would be a good test. In my experience wool yarn, or at least with some wool in it, makes the most luscious pom-poms. They must be steamed though. This opens out the fibres at the cut ends of the yarn, plumping them beautifully. This was my method, following the instructions that came with the Multipom. Firstly I wrapped the yarn 40 times, lengthwise around the Multipom. Doing fine so far. Next it needed to be tied off into 12 equal lengths. Well not equal, as the end tie is closer, which was tricky. Somehow I managed to tie only 11 ties, but couldn’t work out where I had gone wrong. A ruler has been printed on the instruction sheet so it should have been easy. I put it down to me being tired! Tying the wrapping threads was challenging. Another pair of hands to hold the knots tight would have been helpful. The advice to use a strong thread is very sensible as you have to tug hard to make a nice ‘waist’ on each pom-pom before cutting. Tying the knots tight enough was fiddly. Strong yarn needed, and strong fingers. Anyway I decide to get ahead and cut them anyway. Cutting the end ones was awkward,so that pom-pom was more ragged than the others immediately after cutting. Getting the scissors in to cut the end folded yarn was a bit awkward. I rolled each cut pom-pom between my palms to encourage them into balls, and then started to trim them. This is where a pair of curved blade embroidery scissors would be useful. The pom-poms after cutting but before being rolled between my palms. Once again, a good tip is given in the instructions, ‘Don’t be afraid to cut too cut off quite a lot’, and thats what they mean Take it a little at a time and turn the pom-pom as you work; there is a lovely nugget of firm roundness inside those straggly monsters. It took me at least 10 minutes to trim them all to my satisfaction. Then I steamed them by hanging them inside an electric kettle. Do be careful if you do this. Don’t put too much water in the kettle so the pom-poms won’t get wet, and when you take them out be very very careful not to scald yourself with the boiling steam. Use an oven glove and let them cool before handing them. If they do get wet, don’t worry as this can improve their density. It just means you’ll have to wait for them to dry before working on them any further. After steaming the outer fibres expand and fill in the shape. So what’s my verdict on the process and result? Is it quicker than making individual pom-poms on other gadgets? Yes, although the trimming is a bit more arduous. I find the yarn management much easier than when wrapping the small, individual pom-pom makers. It also avoids that situation where you are struggling to pop the two parts together, but they always spring apart again, or worse still the hinged bit pops off. Cutting is a lot easier because you are just slicing straight across rather than inserting the blades between the plastic halves and trying to cut in a narrow space, whilst trying to hold the maker together. When using the Multipom there is the rather fiddly end cuts on the frame to deal with, but that’s only 2 per 12 pom-pom s, so pretty minimal compared to using an individual maker. Wrapping core yarn is easier on an individual maker, as you seem to be able to get a better cinch around a circular waist, although that may improve with practise. I haven’t tried larger pom-poms yet, but I suspect the individual pom-pom makers may give better results because trimming becomes more important to the final shape on big pom-poms. Thanks once again to the Multipom team, it’s good to see innovative tools being designed to meet the diverse needs of the craft community. Spinning is twisting fibres together to make a single spun yarn (singles). All sorts of fibres can be spun, but generally speaking, the longer each fibre is (it’s staple length), the easier it is to spin into a yarn. Singles yarn, especially those with more twist tangle back on themselves, and do not usually make good knitting yarns. They are weaker, and will produce a knitted fabric that lies crooked (bias). When a yarn is spun, the twist of the fibres can only go in one direction, either ‘S’ or ‘Z’ . 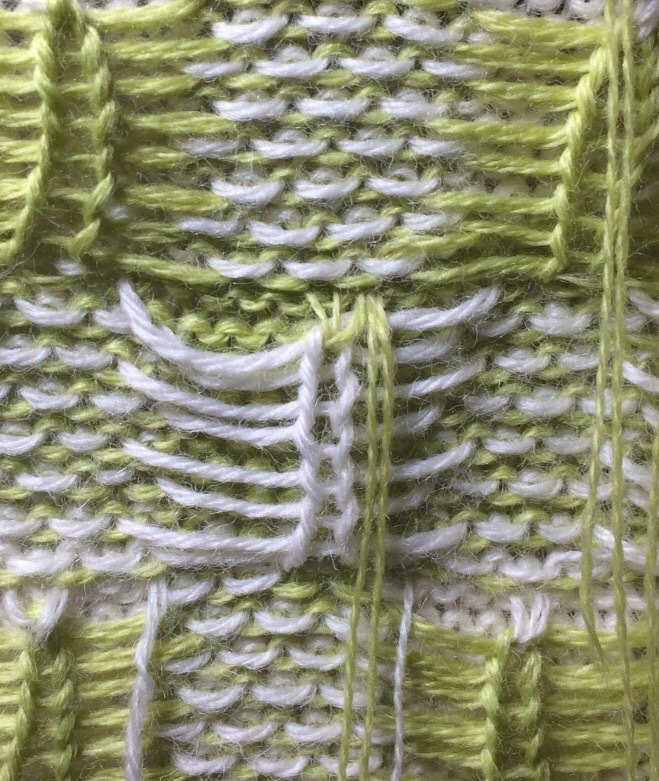 ‘S’ is is when the yarn wraps like the central diagonal of the ‘S’ and ‘Z’ is the opposite direction, when the wrap follows the central line of the ‘Z’ opposite. On a drop spindle, ‘S’ is created by the spindle being spun anticlockwise, and ‘Z’ is produced when the spindle is spun clockwise. On a spinning wheel the direction is controlled by the direction of the wheel itself. Plying is twisting two or more yarns together so that they make one, thicker yarn. It is done for various reasons; it will balance single spun yarns and prevent bias twist, it creates a thicker yarn, it adds strength to delicate yarns, and it combines different colours and textures for aesthetic results and can be used to produce a combination of these results. When yarns are plyed, they should be twisted together in the opposite direction from their original direction of spin, e.g. two ‘S’ spun yarns would be plyed in the ‘Z’ direction. You can ply your own single spun yarn or make thicker and decorative yarn by plying commercial yarns together. Decorative effects to try: threading beads/sequins onto one strand, using a fancy and plain yarn, twisting singles and then twisting them again with commercial yarns in the opposite direction to the first twist (cable plying). Method 1: When plying the same yarn together. Wind a centre pull ball using a ball winder and taking the yarn from both centre and outside ball, ply them together on a spindle. Method 2: When plying the same, or two different yarns together. Wind the two ends of singles (or commercial yarn) together into a double ended ball, tie the end to the spindle and off you go. Method 3: Andean Plying. Can be used in either of the above situations. Step 1: Hold your left palm facing you with the fingers splayed. Step 2: With your right hand, take the end of the yarn, and tuck it into your watch band, sleeve, or hold it under your thumb. Do not lose this end! Step 3: Take the yarn left around the the back of your wrist. Step 5: Then take it left across your palm and around your middle finger from left to right. Step 6: Next take it back around your wrist from right to left. Step 8: When all the yarn is wrapped around your hand, and making sure you don’t lose either end, slip the ring of yarn off your middle finger and twist the whole bracelet of yarn around your wrist so that this ring is on the back of your wrist. If you need to take a break now, slip the main bracelet onto something like a toilet roll centre, being very careful to keep the ends visible. Put the bracket back on your wrist. Once it is on your wrist keep your fingers splayed to prevent it slipping off whilst plying. Tie the two ends to the spindle or leader and start the spindle off. Use your fingers to feed the yarn evenly and control the amount of twist travelling up the yarns as you do when spinning. 4 ends of commercial yarn being plied using the Andean method. Finally it is wound into a hank. It could just be wound onto ball for knitting, but if a bit lively it may need to be hanked, steamed and hung before making into a ball. I bought this efficient little gadget on eBay last week, and it arrived today. 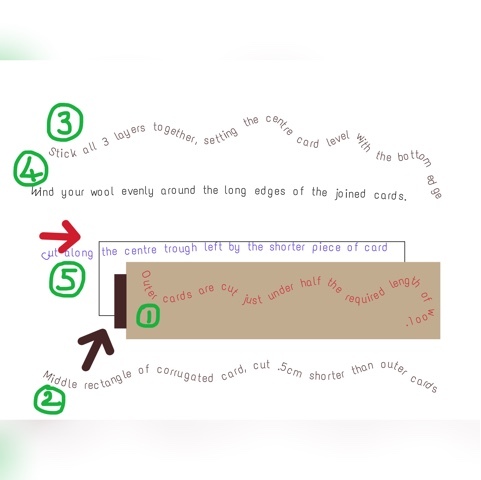 I have been cutting the wool manually with a gauge I made myself from 2 rectangles of heavy mount card stuck both sides a narrower rectangle of corrugated cardboard to allow for the scissors to be inserted to cut the wool. 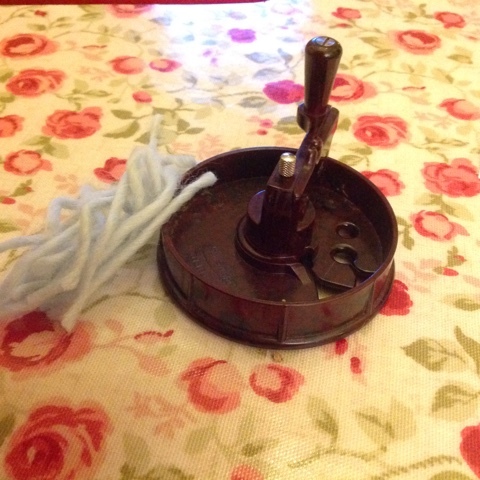 And here is the dingy little Patwin Rug Wool Cutter with some of the shorter lengths. Unfortunately the cutter cuts to a slghtly different length so I can’t use it as is for the rug I have already started. But being inventive I hope I can pad the drum of the cutter so that it cuts to the same length as my gauge. The rug I am currently making is a latched rug hooked into a mesh background. The wool is a British wool and Alpaca mix, which I suspect will shed a lot, although the he British wool should make it reasonably hard wearing. I was seduced into buying the yarn as it was very attractive colours, an soft eggshell blue and a cream which will fit in with most colour schemes, and then a darker teal blue with a rust accent. 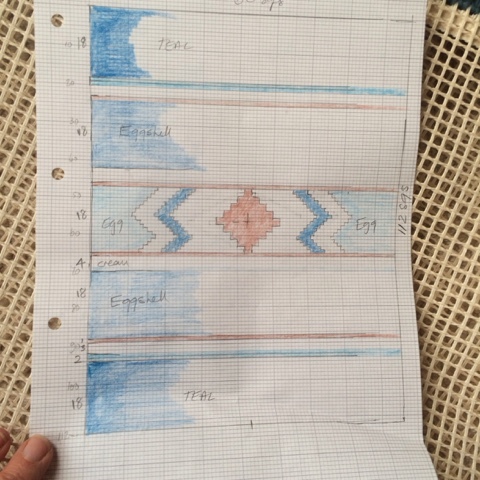 The design is based on an African textile weave in simple graded stripes broken by a middle stripe with diamond and zip zag patterns as in my working graph.